San Francisco readers: You're invited to the 2019 kickoff of Axios' Hometown Tour tomorrow at 8:30 a.m.
Join Axios' Ina Fried for a series of conversations digging into San Francisco's housing crisis and innovative solutions. 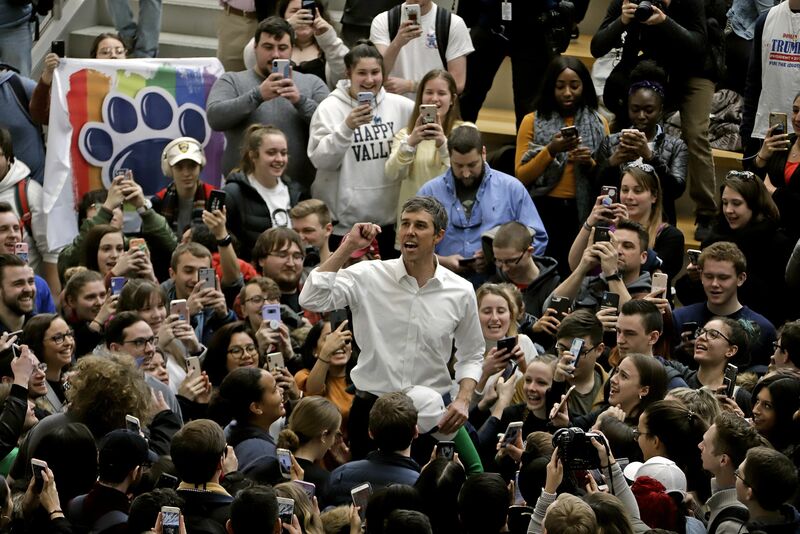 Beto O’Rourke has projected a mostly blank canvas during the first week of his campaign — often asking voters for solutions rather than outlining policy specifics himself, Axios' Alexi McCammond writes. Brazilian President Jair Bolsonaro won with a pro-American campaign that emulated President Trump, and the bromance was consummated yesterday with a White House visit that included a joint news conference. A senior administration official told reporters that Trump started keeping an eye on Bolsonaro early on after hearing him referred to as the "Trump of the Tropics," Axios World editor David Lawler tells me. Top administration officials contend the rush to embrace Bolsonaro isn’t all about matching personalities. They say it’s about increasing trade — ideally at China’s expense — and confronting adversaries like Cuba and Venezuela. The extent to which Bolsonaro has embraced the right fringe of Trumpworld is interesting, Jonathan Swan points out. Is there another major world leader who would dine with Steve Bannon two nights before meeting Trump? Be smart ... Bolsonaro’s rhetoric has offended even more people than Trump’s has: He's wildly homophobic and misogynistic. "That's when the Burbank giant closed the $71.3-billion purchase of much of Rupert Murdoch’s 21st Century Fox." "It’s the culmination of an expansionist strategy that has guided Iger as he has transformed the storied company through a series of takeovers that made Disney the home of 'Star Wars,' 'Black Panther' and 'Incredibles 2.'" "Analysts say that Disney could force smaller studios to merge as they scramble to compete. 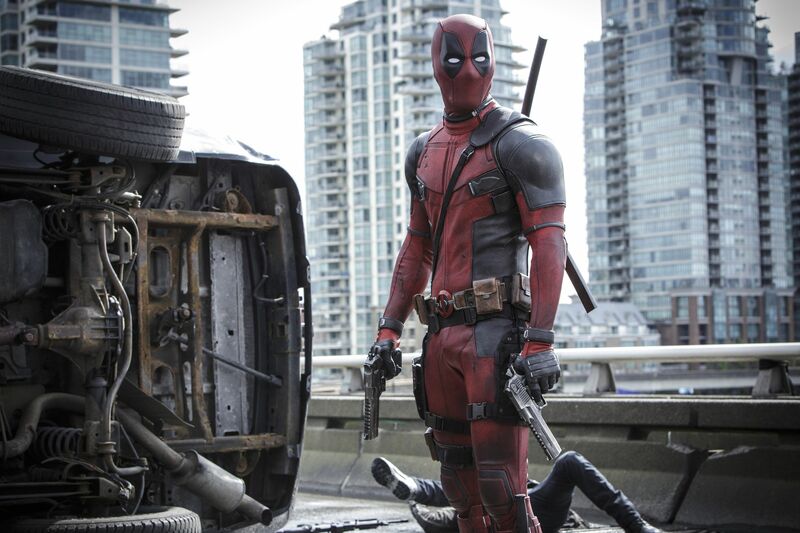 It will have greater leverage over theater owners when it comes to box office splits. And Disney’s plans to use Fox content to forcefully move into streaming could slow the growth of Netflix." 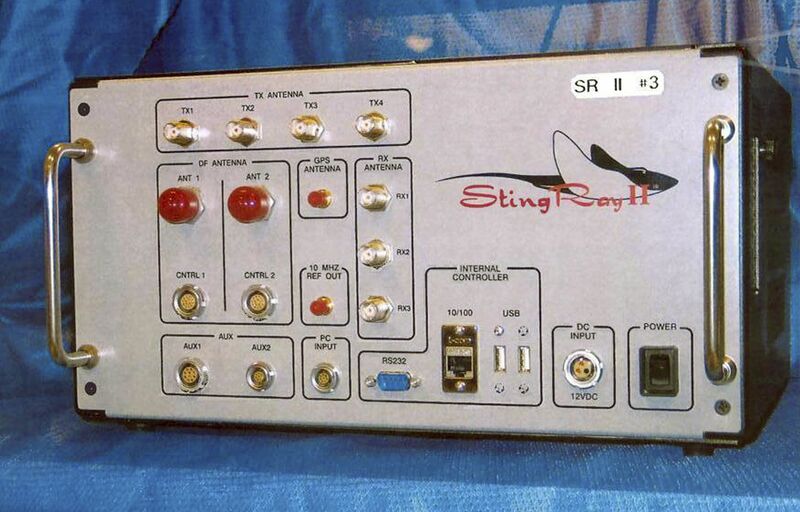 "Agents using a Triggerfish cell-site simulator tracked the whereabouts of Cohen's two iPhones to a pair of rooms a floor apart at the Manhattan hotel where he and his family had taken up residence while their apartment was being renovated." "Police can determine the location of a phone without the user even making a call or sending a text message. Some even allow law enforcement to listen in on conversations or see text messages as they're being sent and received." The FBI "obtained logs of the numbers Cohen was calling and texting, and reams of location data — including for the time period just before the 2016 presidential election, when he negotiated hush-money payments." "They also got permission to press Cohen's thumb to the phones or hold them up to his face to unlock them." China is criticized for its use of deeply controversial surveillance systems to control untrusted elements of its population. But the U.S., too, is developing such know-how as artificial intelligence fast becomes a leading factor in the race for power in the new world order, writes Axios Future editor Steve LeVine. "Trump and his advisers are considering how to weaponize those possible findings for the 2020 race." "One scenario would have seemed downright implausible until recently: The president will take the findings and run on them." He would paint "the special counsel as an example of failed government overreach and ... himself as the victim who managed to prove his innocence." "None of Mueller's indictments, guilty pleas, or court filings has yet shown evidence of 'collusion,'" Garrett M. Graff writes for WIRED. "There have been no shortage of suspicious activities so far: 100-plus contacts with Russia, Roger Stone's odd communications with WikiLeaks, Jared Kushner's request for a secure Russian comms channel, Michael Flynn's odd conversations with the Russian ambassador." "But Mueller hasn’t connected any of those dots yet." "[O]utlining clear evidence of a specific presidential crime." "[A] demonstrable, smoking-gun-included pattern of obstruction." "[D]emonstrable action taken to compromise American interests at the expense of advancing a foreign power's goals." 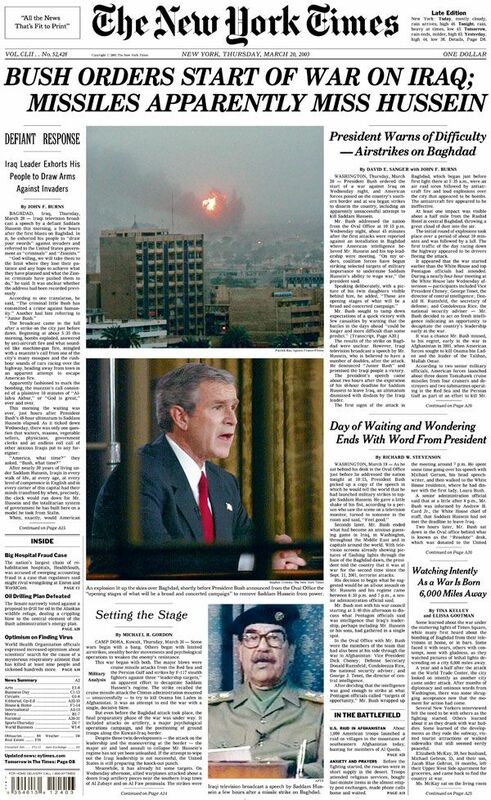 "President Bush ordered the start of a war against Iraq on Wednesday night, and American forces poised on the country's southern border and at sea began strikes to disarm the country, including an apparently unsuccessful attempt to kill Saddam Hussein," the N.Y. Times' David E. Sanger and John F. Burns wrote in 2003. "Speaking deliberately, with a picture of his twin daughters visible behind him, he added, 'These are opening stages of what will be a broad and concerted campaign.'" The first wins of this year's NCAA tournament are on the books after the first batch of this year's First Four games, per CBS Sports. Belmont defeated Temple to win the 11th seed in the East — the school's first win in NCAA tournament history. Fairleigh Dickinson also picked up its first ever tournament win in program history, defeating Prairie View A&M to snag a 16th seed in the West. P.S. ... Kendall Baker's Axios Sports is hosting a March Madness contest and you're invited. How it works: Enter your email here to receive a unique referral link. Once you sign up one friend for Kendall's Axios Sports newsletter, you will both gain access to the bracket. The winner gets a Fanatics apparel item worth up to $200 in value — like a jersey, sweatshirt, etc. "Can You Improve Upon Ranch?" asks the N.Y. Times' Florence Fabricant. "One company thinks so. It’s added French black truffles to its new Trufflin ranch dressing." Her verdict? "The creamy ivory dressing is dotted with bits of the truffles and nicely delivers their haunting aroma and flavor. You could use it on a salad, but I preferred it spooned on Dover sole, a baked potato or a steak."